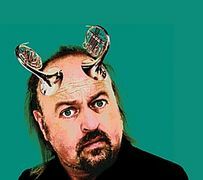 As a classically-trained musician in-tune with contemporary sounds, who better to take us on a journey through the history of the orchestra than Bill Bailey? The former Never Mind the Buzzcocks team captain has always included musical numbers in his acts and for this show recorded at the grandiose Royal Albert Hall in London last year the comedian gets the BBC Concert Orchestra to play. He teaches us about the variations between instruments, the moods they create and the humour that can be found by deconstructing common themes we hear in popular culture in an intriguingly funny show only Bailey could devise. Arriving to the tune of Richard Strauss’s “Also sprach Zarathustra” made famous by its inclusion in Stanley Kubrick’s 2001: A Space Odyssey, Bailey sets out his intention to educate and play with music which has entered popular culture while giving a few gems of knowledge for good measure. He spins round to face onlookers after gatecrashing the orchestra’s start to the performance with a stab on the Royal Albert Hall’s organ, taking control with a goofy smile and wobble of the head. He then spends the first half of his show visiting each instrument in turn, giving examples of how their sound is used — even a Theremin, the electronic device controlled using hand gestures in the air, gets a chance to shine but the highlight is a sublime performance of Saint-Saens’ The Swan on Alpine cow bells which has to be seen to appreciate the comic effect of four men ringing bells to form a famous song. An intriguingly funny show only Bailey could devise. Once introduced, Bailey uses the orchestra to cover all kinds of subjects, including music for 70’s cop shows, sci-fi films, horror movies and news themes. The EastEnders theme is shown to be as morose as the subject of its episodes, we hear the unskippable Universal Pictures DVD introduction played as though we could fast forward it and he talks us through an insightful deconstruction of the music used in old skool cop shows with his own story of the Matchstick gang. Bailey hands it to the orchestra to provide many of the punchlines and drive the show forward, and in the expert hands of Anne Dudley, one of the UK’s most celebrated composers and arrangers, the timing is impeccable. Bailey regulars will be pleased see him perform old favourites such as his ode to Chris De Burgh with the backing of an orchestra and he litters his act with the more surrealist moments to give a flavour of his more normal stand up shows, but this really is a one-off comic spectacular which will win over even with the non-musical at heart. Bill Bailey’s Remarkable Guide To The Orchestra is out to buy on DVD and Blu-ray from November 23rd.